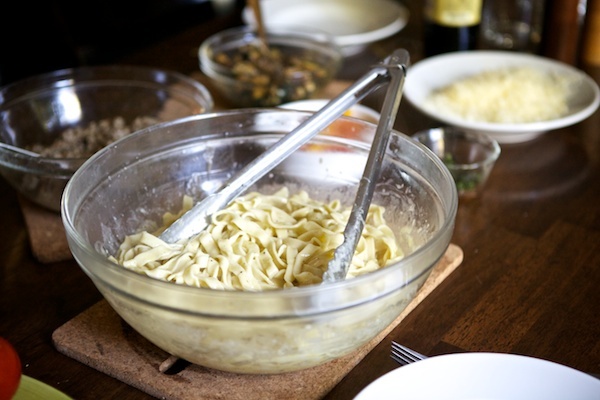 Making pasta at home is quick and easy, once you start you’ll never go back to the dry stuff in a box from the grocery store. You can make it without a pasta roller, but I’d recommend investing in one. It makes the job much easier and it comes in handy for making homemade flat breads and other things. Mine is a cheap $20 pasta maker like this one that I purchased 10 years ago. I’m actually hoping it will die someday because I want to purchase the Marcato Atlas Wellness 150 Pasta Maker, Stainless Steel. But alas, mine refuses to die. I’d recommend investing a heavier duty model, mine’s not super great quality often pulls the dough in crooked, which is frustrating. Of course you don’t need a machine, plenty of people choose to do all the rolling by hand. I like using a machine. Making pasta is not difficult, but it does take a few tries to master it, rolling the dough can be a bit of a challenge until you get the hang of it. Don’t give up after your first attempt, it does get easier. It’s like anything else, it can be a bit awkward at first, keep practicing. Once you get the hang of it, you’ll be able to whip up a batch very quickly. It’s always my go-to recipe when I’m busy and I have company coming for dinner. People are always very impressed with homemade pasta. The the other great thing about fresh pasta is that it doesn’t need a lot of dressing up, a simple toss with good olive oil and some parmesan or romano cheese will make a stunning meal. By all means, please don’t toss it with that cheese that comes in the green plastic can – go for some real cheese and grate it fresh! Pasta is generally made from 2-4 ingredients. I’d recommend starting with basic egg and white flour pasta (some recipes also call for salt and olive oil, I use olive oil in mine). You can use whole grain flour, but it makes the process a little more difficult and the end product different. I’d definitely recommend starting with white flour pasta until you’ve mastered pasta making and then move on to other flours and flavors. Paul Bertolli has a bunch of great ideas for using different kinds of flour (even chestnut flour) in his book Cooking by Hand. 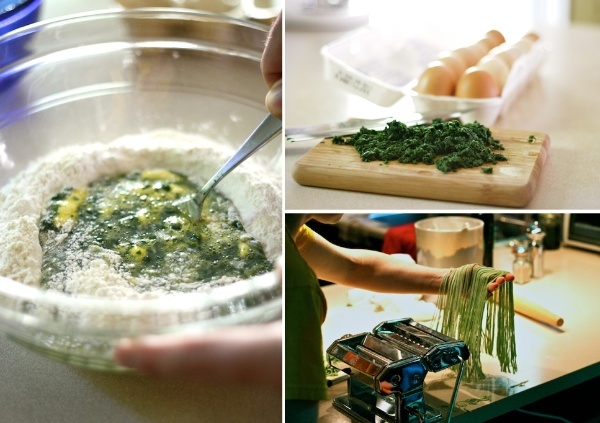 I really like making spinach pasta (as you can see by the photos) and cracked peppercorn pasta. I just purchased some of the special pasta blend flour from King Arthur to try, it contains durum and semolina flours. Pasta dough isn’t difficult to make, but there’s definitely a learning curve. You don’t want to add all the flour called for in the recipe or your dough might be too stiff, which makes it frustrating to work while rolling. I usually save out at least 1/4 cup of flour and often more when mixing up the initial dough. You want the dough to be smooth and slightly tacky, not tough and dry. I like to lightly dust my work surface while rolling it out, this helps incorporate the final flour into the dough, but keeps the dough smooth for easy rolling. You also don’t want your dough to be too soft, or it will be difficult to roll and cut in the machine. After making it too dry once and too wet once, you’ll figure out what the perfect balance is. Place 2 cups of the flour on work surface or in mixer bowl. Make a well in the center and add eggs. Using a fork or fingers, start mixing eggs into the flour slowly. Gradually mix in more and more of the flour from the sides until dough is soft and no longer wet. Knead dough by hand, adding in additional flour as needed to make dough smooth and soft but not sticky or overly stiff. Keeping the dough slightly soft will aid in the next steps. Knead for 2-3 minutes. Place bowl over dough and allow to rest for 30 minutes, this resting period will make the dough easier to roll out. Now is a good time to put your salted water on to boil for cooking the pasta. Divide the dough in half and roll it out into an oval that’s about 1/2-1/4 inch thick. Then feed put it through the rollers on the widest setting. Do this with each piece. Fold dough into thirds like a letter, dust with flour, roll to thin oval again and put through the machine at the widest setting again. Do this 8-10 times until the dough is smooth and not too soft & tacky. After making pasta a few times you’ll get a feel for what’s the right texture for the dough. Dust dough with flour as needed during rolling. After you’ve run the dough through the machine 8-10 times at the widest setting you’re ready to start thinning the dough. I usually roll all the pieces through then adjust the rollers. Dust each piece with flour after each pass through the rollers. As the piece gets thinner it will get longer and longer and can become a bit unruly. Feel free to cut down to a more manageable size. I generally cut mine into three pieces once it’s gets too long to handle easily. It’s a personal preference thing really, whatever you feel comfortable doing. It may be easier at first cutting it into shorter pieces, then as you get more comfortable with the rolling process you can keep the pieces long. Roll them to the desired thinness, I generally roll mine down to the thinnest or the second thinnest setting. I have found it handy to keep a damp towel around to drape over the dough. My house is pretty dry though. Always dust the dough lightly with flour, never stack dough or it will stick together. Try to keep the sheets separate, stacking the dough will often result in the pieces sticking together. If this happens, simply start at the thickest setting and start over. Next cut the pasta into desired shape. 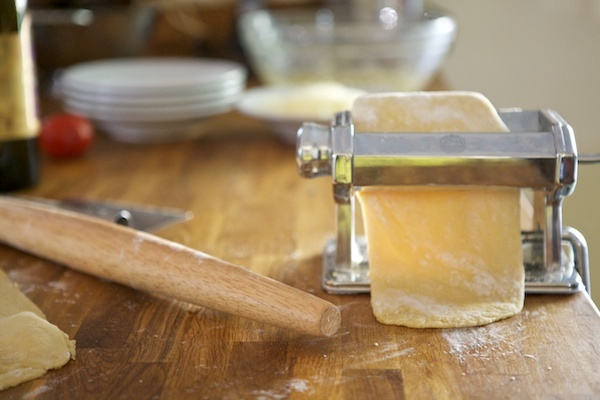 Lightly flour sheets of pasta before cutting so the noodles don’t stick together after cutting. 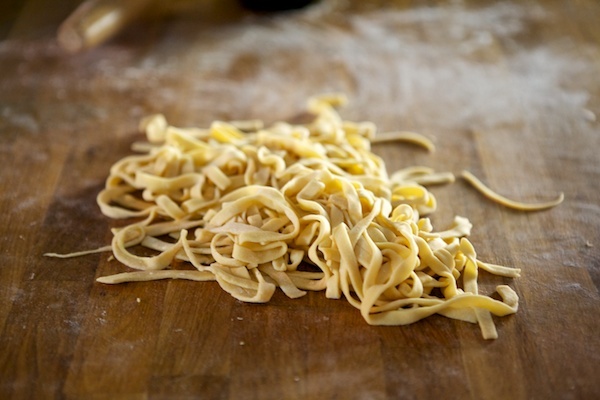 It can also be beneficial to toss the cut noodles with a bit of flour to avoid a big sticky mass of noodles. Don’t let them sit too long on the counter or pile them in too big of a pile either. Drop noodles into boiling water and cook until desired doneness. I generally cook mine for 5-7 minutes. If desired, dry the noodle by hanging on racks (I admit, I’ve never been able to wait to dry them, they’re always cooked fresh here). Some cookbooks will tell you hang the pasta to dry on a rack, I never do. I usually toss mine with a little flour to keep it from sticking together if the water isn’t ready yet. Check it every so often, by tossing a bit to make sure it’s not sticking together. Feel free to dry it a little if you want, I just never wanted to buy a drying rack and I don’t really have room in the kitchen for it. My go-to way to dress pasta is as follows: break 3 eggs into a large bowl, add freshly grated sea salt and pepper, grate about a cup of good hard cheese over top, add a couple glugs of really good olive oil, mix thoroughly with a fork. Set aside until pasta is finished. After draining freshly made pasta, pour in bowl on top and toss. The hot pasta will cook the eggs and cheese into a wonderfully creamy sauce. It really is that simple, no need to cook an alfredo sauce or dirty up any more pans. What’s your favorite way to top pasta? Wow.. I dont have a favorite way to make pasta because it (wheat) doesnt like me.. so I almost never eat it. M’honey would love it though if I made him homemade pasta.. He’d probably thought he died & went to heaven..
I’ll have to give it a go one of these days. 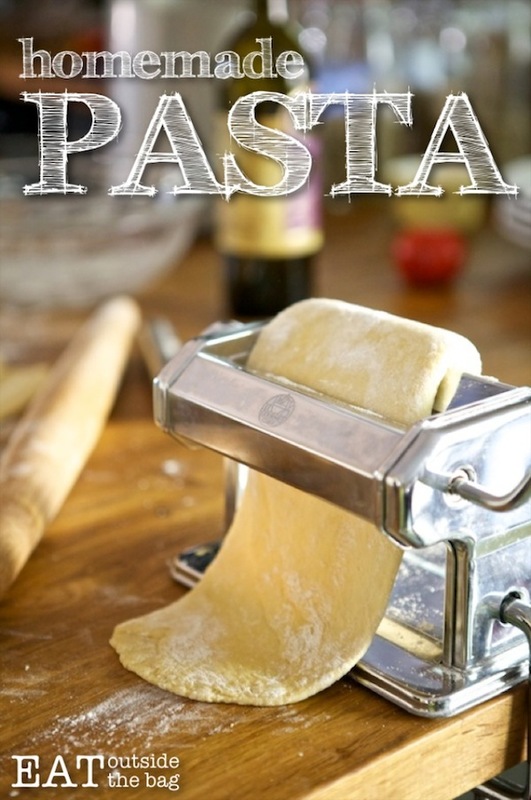 Yum… You’ve motivated me to pull out our pasta maker. My favorite toppings: either pesto, or a mix of olive oil, fresh grated asiago or parmesan, artichoke hearts and sundried tomatoes. I’ll add peas if I have them. Delicious. Thanks for posting! excellent recipe 🙂 Loved the ease of making the sauce, although I should have added more olive oil…I’m thinking some garlic would be good too.